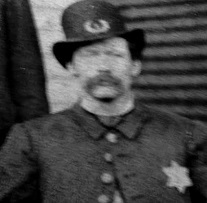 On this date in 1874, Christopher Rafferty was hanged for the murder of Chicago Patrolman Patrick O’Meara, who was shot to death on August 4, 1872. A fourteen­-year veteran of the force, O’Meara was not the first officer of the Chicago Police Department to die in the line of duty — but he appears to be the first whose death brought about a legal execution. The murder went down like this: Rafferty, a bricklayer by trade and a bit of a hard case despite his youth (he was 25), had participated in a riot the week before the shooting. Rafferty and two other men, one of them his brother, were arrested and then released on bail. Rafferty swore he was innocent and claimed a man named Donovan would support his story, but Donovan refused to provide him with an alibi. To pay him back, Rafferty tracked Donovan down and beat him with a brick. Donovan staggered to the police station, reported the crime and swore out a warrant against his assailant. At a little after midnight, when O’Meara and his partner, James Scanlan, tracked Rafferty down at Daniel O’Brien’s Saloon at Halsted Street and 35th Place, the thug seemed to be in a good mood and even offered O’Meara a cigar. He seemed to cooperate when the two officers told him they had to arrest him, but then bolted for the door while simultaneously pulling a gun from his pocket and firing at the two policemen, hitting O’Meara in the chest. O’Meara collapsed and bled out on the saloon floor. His last words were, “Stay, Chris, don’t shoot.” But Rafferty shot again, barely missing Scanlan’s head. After a struggle with Scanlan, he escaped into the night. [O’Meara’s] cold­blooded murder outraged Chicagoans. It was an atrocity further deepened by the fact that the killer had escaped. Local neighborhood folks took to the streets frantic with excitement following his murder, forming small posses that headed out to the prairie grass to hunt for the killer. Local police officials soon persuaded people to permit Chicago detectives to track Officer O’Meara’s murderer down themselves. They caught him just a few hours later, walking in the fields on his way to Joliet. Rafferty was tried and convicted of the murder a month later, but his conviction was overturned twice on procedural grounds. His three separate trials and convictions are responsible for the long (for those days) wait between his arrest and his execution. He met his death calmly and without a struggle, sleeping “as peacefully as a child” in the hours before his predawn hanging. His father was permitted to visit him shortly before the execution, and two priests accompanied him to the scaffold. His was the last public hanging in Lake County. And likewise pay attention to a few lines I have here. On the 28th** of February, all on the gallows high. I left my aged parents in sorrow for to cry. Constantly good advice they always gave to me. Or State’s Prison or the gallows my doom would surely be. Scanlan and O’Meara, they came in a saloon. Which leaves a loving wife and husband for to part. My companions and associates they were all standing by. And to leave out their night­walking before it was too late. Killer and victim both rest in Calvary Cemetery. * It must have been a hit, since the same ballad also got re-used for President James Garfield’s assassin. ** Despite what the verse says the execution was on the 27th, not the 28th. A few day ago I encountered a cop and told him about this case and how it set a precedent in Chicago, and asked if these days self defense could ever be a valid defense for killing (or even assaulting) a cop. He said no. Even in cases where SWAT teams have raided the wrong house (which happens sometimes, horribly enough) and gotten shot by the occupants who think it’s burglars or something, charges have resulted, or if the SWAT people shoot back, it gets ruled justifiable homicide. I’ve been going through “The End of Watch” looking for possible Executed Today fodder (I’m up to the 1920s now) and you may be surprised to know that, although Rafferty was the first to hang for killing a Chicago police officer, his victim was not the first Chicago police officer to be murdered in the line of duty. Indeed, quite regularly in the early days of the force, the killer would plead to manslaughter, or even be acquitted of all charges, on the grounds of “self-defense.” It’s hard to imagine that happening nowadays. I actually found myself wondering whether it is actually legal anymore to defend oneself against an on-duty police officer, even if he’s obviously going overboard. Given the number of highly publicized police brutality cases in recent years, it would appear that the answer is no. But I really don’t know. My dad has a friend who, as a graduate student in Chicago in the 1960s, was convicted of felony assault on a police officer at a protest. Dad says he was there and what really happened was his friend assaulted the police officer’s baton about a dozen times. When was the last time a person was acquitted of assaulting and/or killing a cop on grounds of self-defense? I’d love to know.